(TORONTO) – There are many good reasons why drivers have made the Canadian-built Toyota Corolla one of the country’s best-selling passenger cars – not least of which is an impressive list of more than 100 improvements on the current, 10th generation model, which the Automobile Journalists Association of Canada named its 2009 Best New Small Car under $18,000, and one of three finalists for AJAC’s Canadian Car of the Year. Regardless of trim level and options, all 2010 Toyota Corolla models are built in Cambridge, Ontario and designed for Canadian driving, delivering performance, value and plenty of features and amenities that drivers typically expect only on larger, more expensive vehicles. New for the 2010 model year, the Corolla S and Corolla LE models join the Corolla XRS in featuring Toyota’s Vehicle Stability Control (VSC) technology as standard equipment. VSC is also available on Corolla CE models equipped with the Enhanced Convenience Package. The Corolla S and Corolla XRS may also be ordered with a new Leather Package, while a new Moon Roof and Navigation Package is available for the Corolla LE. 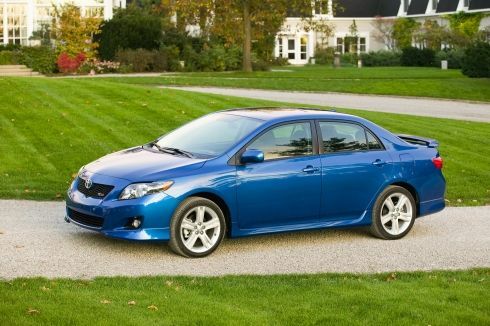 The 2010 Toyota Corolla is now on sale across Canada. The Corolla CE carries a manufacturer’s suggested retail price starting at $15,460. The Corolla S starts at a suggested price of $20,285, the Corolla LE starts at a suggested price of $21,165, and the Corolla XRS starts at a suggested price of $22,550. Toyota has built the Corolla for more than 40 years, and today’s Corolla – the 10th generation – has improved in almost every way from that first model. In fact, the Corolla delivers more power, more performance, more efficiency, more safety, more comfort, more style and more standard features than any previous generation, thanks to more than 100 key improvements. Today’s Corolla represents the same remarkable value that has put tens of millions of drivers behind the wheel of a Corolla worldwide. That’s because when the very first Corolla rolled off the production line, it established a defining statement about Toyota: namely, that quality, reliability and durability are affordable. Those same core values – that same Toyota DNA - is found in today’s Corolla. But there’s more too: The Toyota Corolla is also a Canadian success story. That’s in part because Toyota is committed to building its most popular vehicles in the markets where they’re sold. With Corolla, that means Canada: Toyota has been building the Corolla in this country for more than 20 years… and team members at Toyota Motor Manufacturing Canada (TMMC) in Cambridge, Ontario played important roles in shaping the design of the current generation Corolla to ensure it continues to be a favourite choice with Canadian drivers. Attention to detail – such as pedal spacing that accommodates the average Canadian male’s winter boot size and door pockets that securely hold ice scrapers – combined with TMMC’s well-deserved reputation for quality helped more than 57,000 Canadians choose a new Corolla last year. With added standard features to more models and new options packages, the 2010 model Corolla is ready to roll into more Canadian driveways. More power – less fuel. That’s what Canadians expect from their vehicles, and that’s why Canadians are so keen on the Toyota Corolla. When Toyota introduced the 10th generation Corolla a year ago, it featured a choice of two all-new engines that deliver more power and efficiency than ever before. The engineering paid off in 2008 when the new Corolla drove 1,017 KM on a single tank of gas, outperforming a dozen compact cars from other manufacturers to win the CanadianDriver 50 Litre Challenge™. The 2010 model year sees the return of these two proven four-cylinder engines. Whether one chooses the powerful yet efficient 1.8litre engine found in the CorollaCE, CorollaS and CorollaLE… or the sporty 2.4litre that powers the CorollaXRS… Canadians trust the Toyota Corolla to deliver the power they want, and the fuel-friendliness they need. Drive it and you’ll know – the Corolla’s European-influenced handling and control systems deliver dynamic performance that’s apparent as soon as you pull away from the curb and leaves a lasting impression. Canadian drivers will appreciate the confident handling of front-wheel drive, electronically controlled throttle and electric power steering – standard on all models. Combined with an independent front suspension featuring Macpherson gas struts and a torsion beam rear suspension, plus coil springs and stabilizer bars – front and back – all Corolla models deliver rapid, controlled and smooth response and handling. New for 2010, CorollaS and CorollaLE models are now standard equipped with the Toyota Vehicle Stability Control (VSC) system found on the CorollaXRS. VSC is also available for CorollaCE models if ordered with the Enhanced Convenience Package. For even more sporty fun, the CorollaXRS features a front strut tower bar and sport tuned rear suspension to take advantage of this model’s additional horsepower and torque. 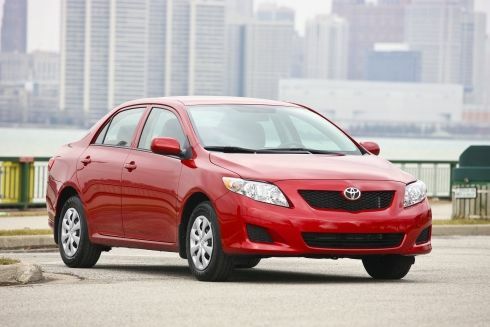 The Toyota Corolla is a popular choice for those who need dependable transportation day in and day out. Whether it’s the daily commute to work or school, getting around town, or hitting the highway, there will come a time in every driver’s life when they absolutely depend on their brakes to keep them out of trouble. When that day comes, Corolla owners will find they benefit from plenty of stopping power, thanks to front ventilated disc brakes that are larger than on previous generation Corolla models for improved braking ability. CorollaCE, CorollaS and CorollaLE models feature rear drum brakes, while the higher-performance CorollaXRS is fitted with rear disc brakes. All are backstopped with a suite of Toyota braking technologies as standard equipment, including Toyota’s Antilock Braking System with Brake Assist and Electronic Brake Force Distribution. Canadians wanted a compact that could do more for them, and the Corolla delivers, with a roomy interior that comfortably accommodates up to five passengers plus luggage. The current generation Corolla features more headroom, legroom and cargo space than ever before, giving compact car lovers comfort and versatility that’s more akin to a mid-size. Corolla owners drive their vehicles – a lot. And every time they get behind the wheel, they know that Toyota has put their safety first and foremost. Nowhere is this more apparent then on this 10th generation Corolla, which delivers world-class safety performance by meeting, or bettering, the most rigorous safety standards from around the planet. Safety starts with seeing, which is why all 2010 Corolla models are fitted with wide-view halogen headlamps that throw light a great distance to help drivers see and avoid potential problems. When problems occur, the Corolla creates a safety cocoon for driver and passengers. From its carefully designed, impact-absorbing body structure that was designed to achieve top marks in its segment from the Insurance Institute for Highway safety… to the six airbags… to Toyota’s Active Front Headrest system, which helps reduce whiplash injury caused by rear-end impacts… occupant safety is top of mind, to deliver peace of mind. What’s more, the Corolla’s safety credentials extend beyond those riding in the vehicle. The 10th generation Corolla features a low mounted engine and hood, hinge and wipers that have been carefully designed to minimize any injury to pedestrians in the event of a collision. New for the 2010 model year, the CorollaS and the CorollaLE join the CorollaXRS as having Toyota’s Vehicle Stability Control (VSC) system included as standard equipment. VSC is also fitted on 2010 CorollaCE models ordered with the Enhanced Convenience Package. Three-point lap and shoulder seatbelts are fitted in all five passenger positions, and include pre-tensioners and force limiters for the front seating positions, plus adjustable “B” pillar shoulder belt anchors. Younger occupants are protected with anchor points for child-restraint seats and child protector locks on the rear doors. 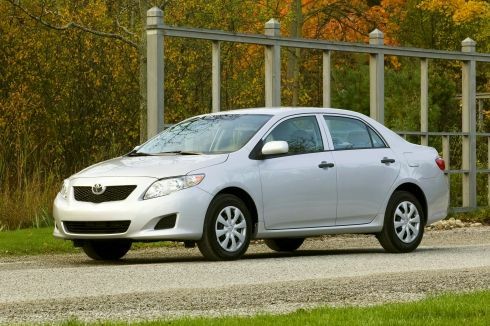 All 2010 Corolla models are also equipped with an engine immobilizer. Buyers may personalize their 2010 Toyota Corolla using Toyota Canada’s web site (www.toyota.ca) or in any Toyota Dealership across Canada. The 2010 Corolla is provided with Toyota's no deductible, no transfer fee, comprehensive warranty that covers the entire vehicle for three years/60,000 kilometres. Power train components are covered for five years/100,000 kilometres, major emission control components are covered for eight years/130,000 kilometres and corrosion perforation for five years with unlimited distance. Toyota also provides 24-hour Roadside Assistance for all models. Help is just a phone call away at 1-888-TOYOTA-8. Roadside emergency services include battery boost, lockout service, fuel delivery, tire change, winching, and even towing. Optional Extra Care Protection is also available, which includes travel planning and trip interruption assistance, vehicle rental help, lubrication maintenance, and mechanical protection of 17 major mechanical component groups for up to six years/200,000 kilometres. Includes: Air conditioning with dust, pollen, deodorizing air filter; power door locks with keyless entry; power auto door lock with shifter activation (auto transmission models); colour-matched door handles; tire pressure monitoring system. Includes: Air conditioning with dust, pollen, deodorizing air filter; power door locks with keyless entry; power auto door lock with shifter activation (auto transmission models); colour-matched door handles; tire pressure monitoring system; Vehicle Stability Control; Traction Control (TRAC); power windows with driver side auto down; cruise control. Includes: Power moon roof; overhead console box. Includes: Power moon roof; overhead console box; heated driver and front passenger seats; leather seat surfaces. Includes: Heated driver and front passenger seats; leather seat surfaces. Includes: Power moon roof; overhead console box; eight-way power adjustable driver seat; power lumbar support; rear seat fold-down centre armrest. Includes: Power moon roof; overhead console box; eight-way power adjustable driver seat; power lumbar support; rear seat fold-down centre armrest; DVD-based navigation system. Features: Dual overhead cams; 16 valves; Dual Variable Valve Timing with intelligence (Dual VVT-i); Direct ignition system; Electronic Throttle Control System with intelligence (ETCS-i); stainless steel exhaust system; sound insulating engine cover. Features: Dual overhead cams; 16 valves; Variable Valve Timing with intelligence (VVT-i); Direct ignition system; Electronic Throttle Control System with intelligence (ETCS-i); stainless steel exhaust system; sound insulating engine cover. Fuel efficiency 7.5L/100km city; 5.6L/100km highway. Fuel efficiency 9.5L/100km city; 6.7L/100km highway. Fuel efficiency 7.4L/100km city; 5.6L/100km highway. Features: Overdrive; sequential multimode shifter. Fuel efficiency 9.4L/100km city; 6.5L/100km highway. DIS is an ignition system without a distributor. This improves reliability by removing a number of mechanical components. It also delivers greater control over ignition spark generation and enables ignition timing to be controlled over a wider range – both of which contribute to reducing exhaust emissions. Neck injuries are the most common reported injury in an accident. Toyota’s Active Headrest technology is designed to reduce the stress on the neck during low-speed rear accidents. When a person’s lower back presses into the seatback, the headrest moves forward and up to catch the back of the head, thereby helping to reduce the incidence and severity of whiplash.